I may be biased, but I have to hold my hands up and say that I think that the Crème Fraiche from Neal’s Yard Creamery is the best I have ever tasted. Since leaving London it’s been missing from my life and I had just about kidded myself that I didn’t miss it all that much, until I tried some again and all pretence was gone. Damn that stuff is good. I could sit down with a great big pot and a great big spoon and be one very happy girl. It does everything a crème fraiche should: accompanies a chocolate tart or apple pie, gives a silky, lovely texture to everything cooked with it but equally, you could just sit down and stuff your face with the hard stuff and revel in its light, lactic, buttery flavour that steers just onto the clean side of richness. I am equally enthusiastic about their yoghurts. There’s a joy-enducing layer of cream on top and the flavour is so much richer and more complex than the standard, straight-down-the-line acidity of most yoghurts, with an almost salty, savoury edge. Suffice to say it wasn’t just the cheese that interested me on this trip to Neal’s Yard Creamery. I have an interest in yoghurt making and the idea of making my own crème fraiche in my own dairy at some future point is definitely something I like the sound of. Monday is crème fraiche day at Neal’s Yard Creamery and Thursday is yoghurt day. Both follow a similar routine as the milk and cream are both heated first before cooling to the appropriate temperature for the starter to be added. This helps actually form a firmer set. In an amateur way, at home, I have played around with various ways of making yoghurt using both Jersey milk from Ivy House Farm (back when I was in London), milk from the local supermarket (not really recommended) and finally sheeps milk from Martin & Nicola’s in Cumbria. I tried it heated first and then cooled and I tried it just incubated from room temperature and can report back that it is indeed true; you get a better set if you heat the milk first. While a loosely set, very delicate yoghurt is actually quite fun to eat, it’s no good commercially if the yoghurt has to travel any further than from the fridge to kitchen counter. Same goes for crème fraiche. So, both are effectively pasteurised and then cooled down to the appropriate starter temperature. In the case of the Crème Fraiche which is made using a mesophilic starter (the much revered MT36) this temperature is around 26C while the Greek Yoghurt starter, being thermophilic, needs to only cool to a temperature somewhere in the low 40s C. The cultures added and left to disperse and begin to incubate for a little while, it is then time for pouring. Pouring is an exercise in itself when you make as much of both yoghurt and crème fraiche as Neal’s Yard Creamery do. 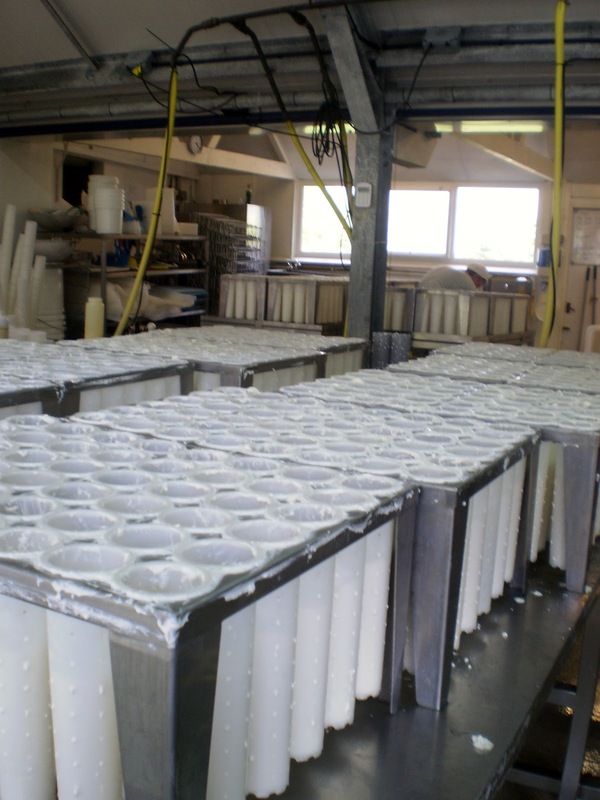 A pallet is wheeled in, stacked high with cardboard trays each containing either 340g pots (12oz as it used to be when they started out) or 116g pots (4oz). 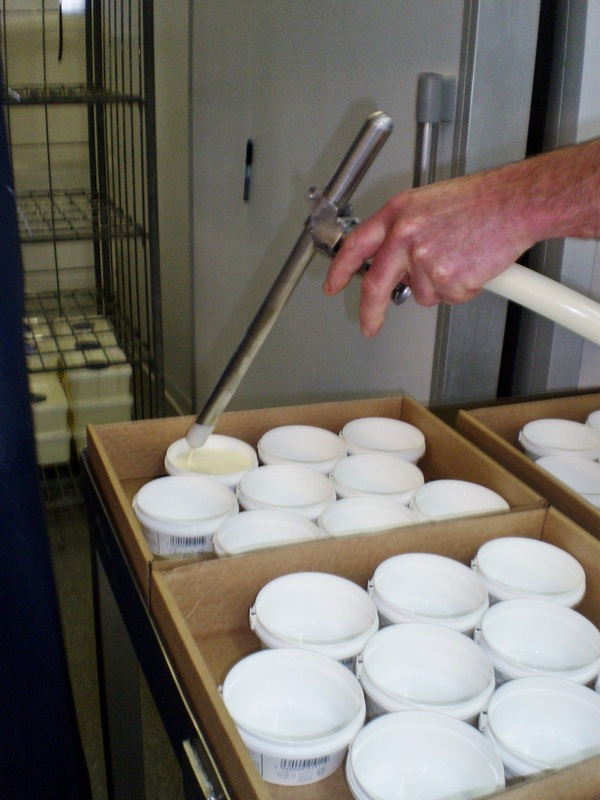 All of these need to be filled and no spillage is allowed as the trays then become greasy and messy and any spare crème fraiche or yoghurt coagulates on lids or bottoms of pots and creates a display nightmare for any retailer that is buying them. 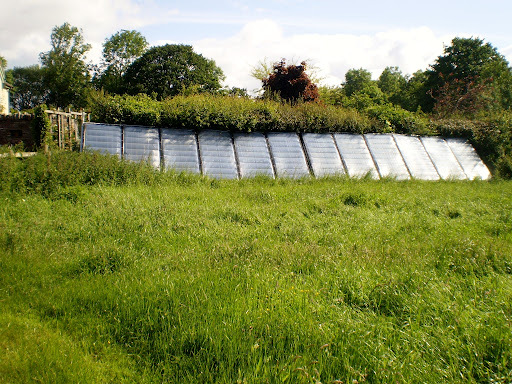 Each of these in turn needs the lids snapped on and it has to be done in a particular way so that they don’t bulge and look blown. Then, after the fiddly work, it’s time to fill the catering sizes: 2.5lt tubs, 5lt buckets and even 25lt buckets. All of these, once filled, are transferred to trolleys and wheeled away to spend 24hours in an insulated room designed to keep them at just the right temperature to get them to set. 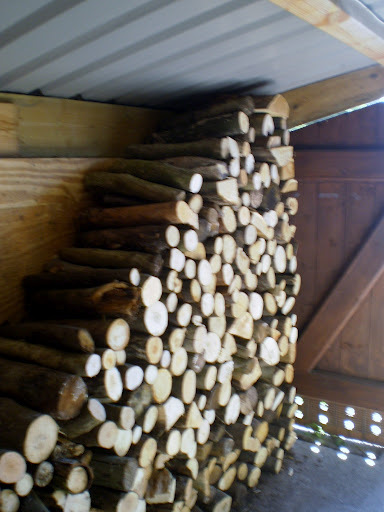 The following day they are refrigerated and from then on are ready for sale. Pouring fiddliness aside, the actual process is quite simple; it’s choosing your ingredients with extreme care and then handling them with respect that makes for such good yoghurts and crème fraiche. The organic double cream used for the crème fraiche is delicious and is handled carefully to make sure the fats are kept as intact as possible. The milk used for the yoghurt is the same milk as is used for their Finn and cows curd cheeses and is already chosen carefully because of its fats, proteins and the care the farmers take over their animals. 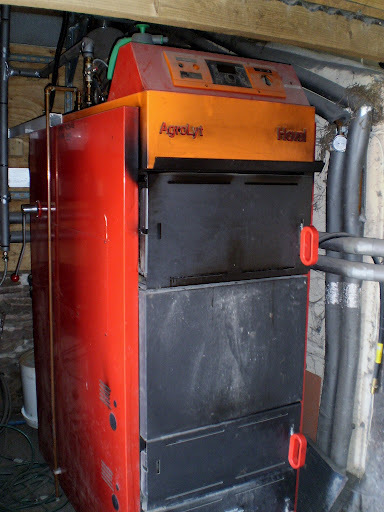 Both are heated gently and slowly in a vat rather than being pumped aggressively through a pasteuriser and heated at speed. Finally the cultures are tried and tested. They use the same yoghurt culture as was used all those years ago when Neal’s Yard Creamery and Neal’s Yard Dairy were one and the same. Experience has taught Charlie and Haydn that it works best if they make up a strong bucket of the starter and leave it for a week to culture and incubate, then add it the following week. Keeping a rolling mother culture going, always using one bucket of last week’s yoghurt, lead to the more complex flavour gradually diminishing to a straight forward acidity. And what more can be said about MT36 (their creme fraiche starter) except it just delivers. Used now by Graham Kirkham (Kirkham’s Lancashire), the Trethowan family (Gorwydd Caerphilly), Joe Schneider (Stichelton) and Martin Gott (St James & Brother David), it delivers rich but lactic flavours in whatever it is used for. Lactic cows milk cheese is a subject dear to the heart at the moment as one of the dairies I’m working with, is interested in making a Chaource style cheese. When I heard about this, it pretty much clinched me wanting to work with them as, independently, I had been thinking of making Chaource myself when I set up on my own, inspired in part by Jasper Hill Farms’ Constant Bliss made over in Vermont and also by a couple of very happy days in the dairy at Hill Farm Dairy making Stawley with Caroline Atkinson. It therefore follows on that while at Neal’s Yard Creamery I was particularly keen to spend some time observing how they make Finn. 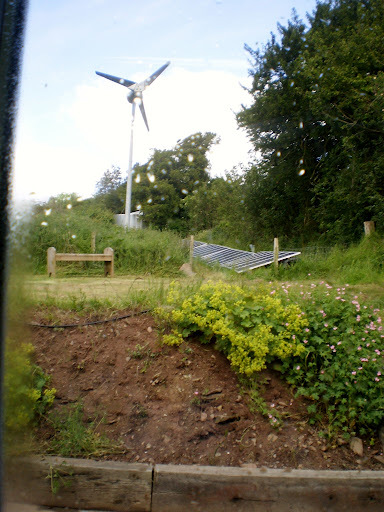 On the Tuesday morning, bright and early, Charlie set off with their little trailer and tank (and yours truly in the passenger seat), heading for the farm to collect milk. 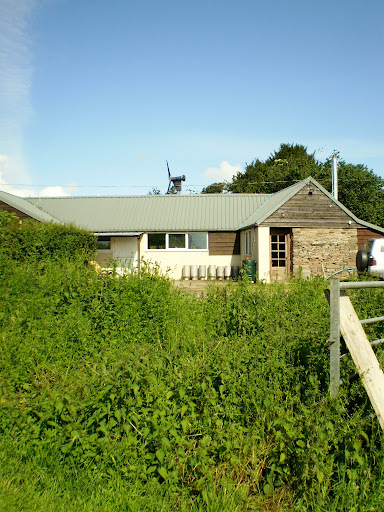 While the goats milk comes from about an hour away in Gloucestershire, the cows milk is a mere half hour away near Glasbury on Wye at the farm of Andrew & Rachel Giles. Their cows are New Zealand Friesian, a very similar breed to the old British Friesian and as such have higher levels of fats and proteins than the industry standard the Holstein or Holstein Friesian cross. There are a few Jerseys as well whose influence is probably pretty diluted across the herd as a whole but will give a little extra richness. 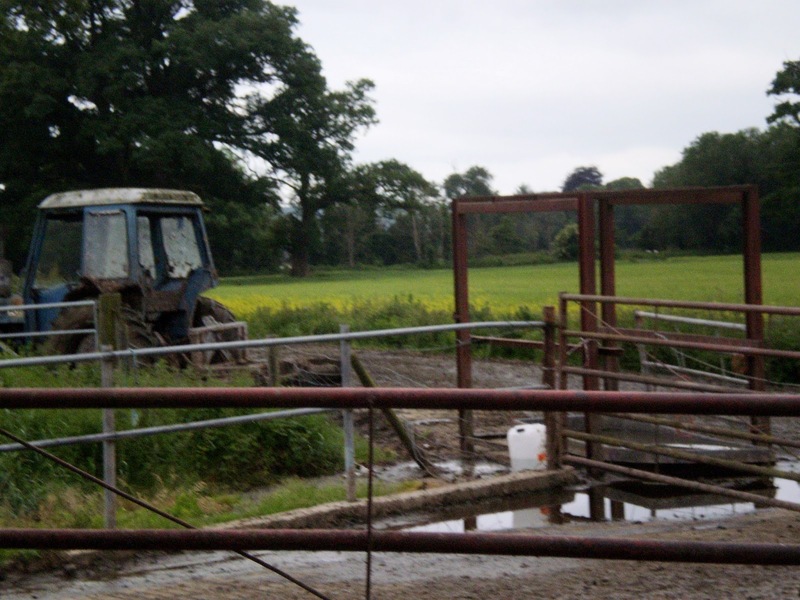 They are also farmed on a New Zealand system being out on grass for as long of the year as possible and requiring less concentrates and a more natural feeding regime as a result. 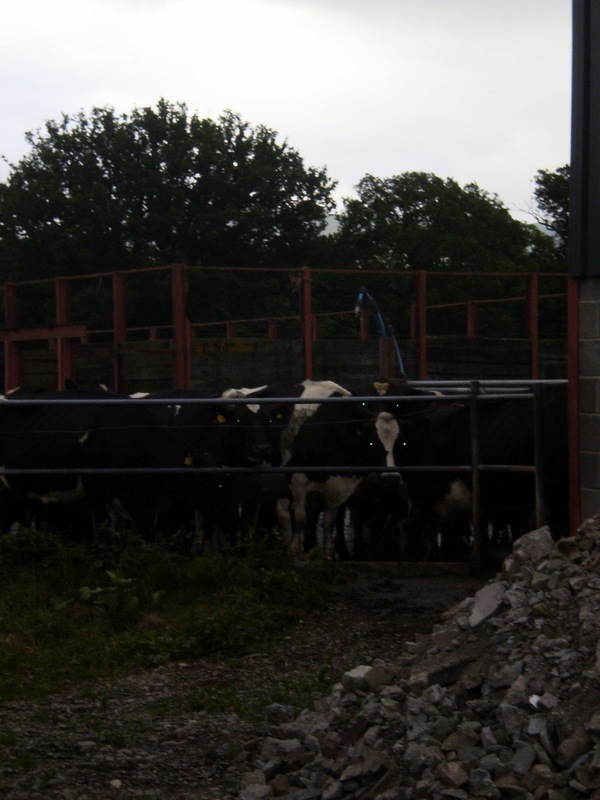 As we arrived at the farm, the milking was in progress and all seemed calm and under control. We greeted the milkers and unloaded milk from the bulk tank into our little tank on the trailer. 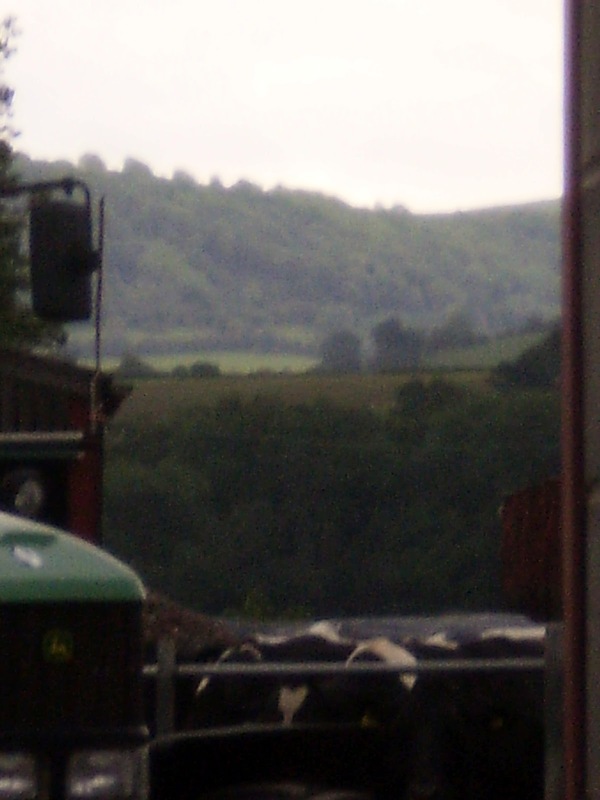 As we filled the tank, I could see in the distance, the cows that had been milked happily making their way back to the fields. They know their way back without a guide. Back at Neal’s Yard Creamery, the milk was ready to process. Starter had been made up and was added. 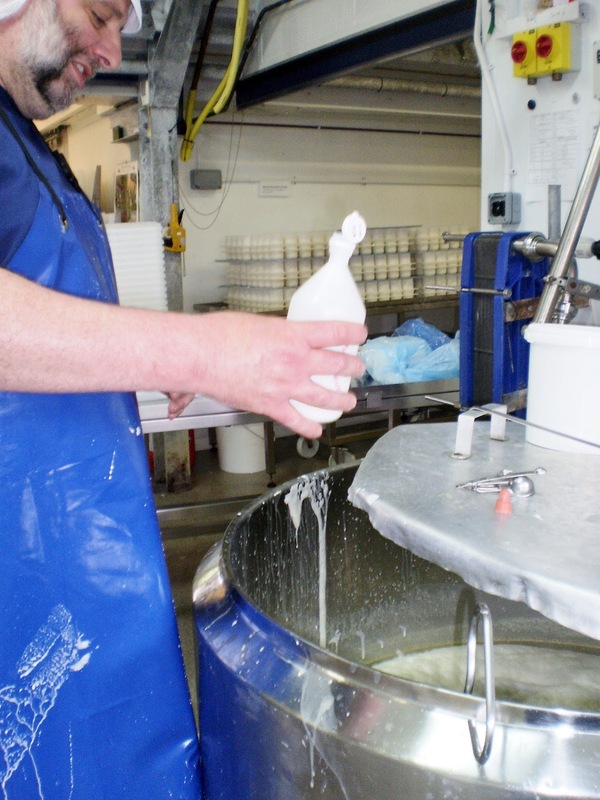 Double Cream was added too and the buckets left with the milk ripening. 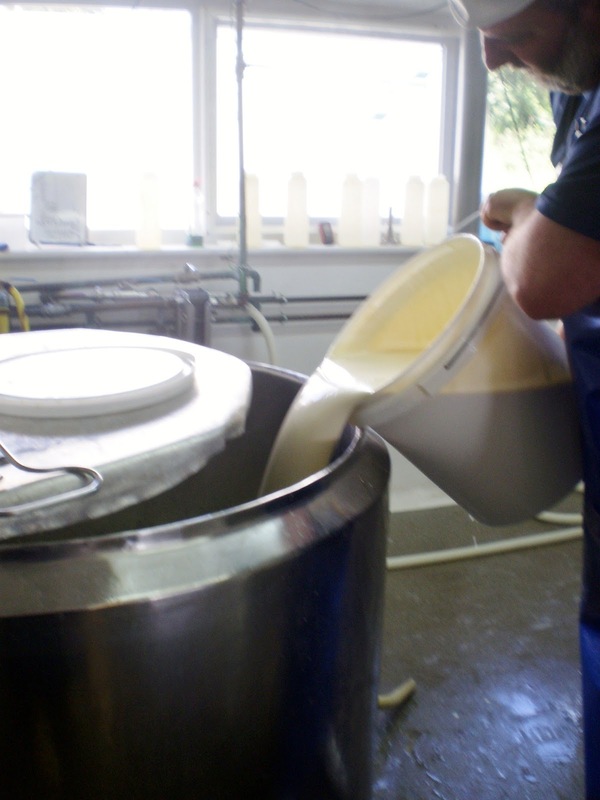 It follows the same lactic process as the goats milk, rennet late afternoon and ladling the following morning but the composition and cream content are less co-operative than with the goats milk. 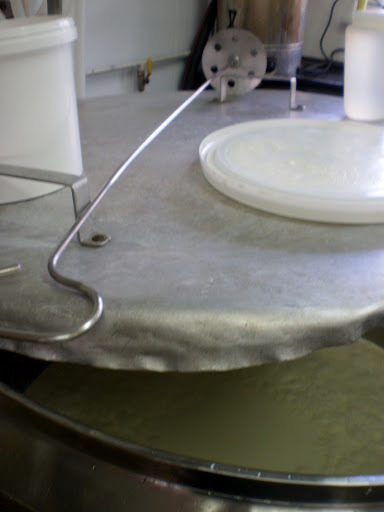 Cows milk will separate out into milk and cream more readily than sheep or goats milk and especially when kept at warm temperatures such as the 22C or thereabouts that lactic cheeses like to set at. 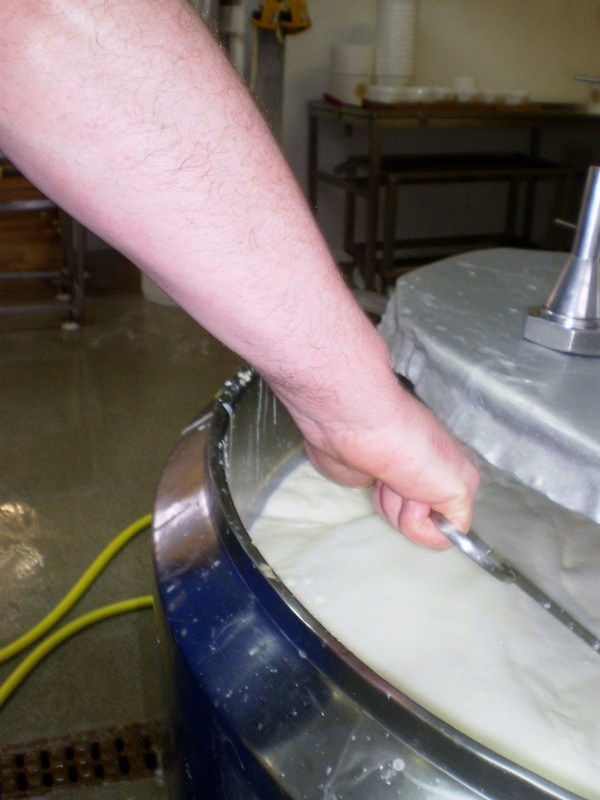 The danger therefore when making a lactic cheese, is that your cream separates out on top and forms a set cream cheese rather separate from the other curd. To counteract this, Haydn goes back after the rennet has been added but before it is actually set and stirs the cream back in again. This is something I have tried too since then when making a couple of batches of Jersey milk cheese and getting the timing right is by no means easy, believe you me. However if done correctly, the curd the following morning has a lovely clear whey pool above it and the cream is integrated into the mix. And this is what we found the following morning when checking the pH. 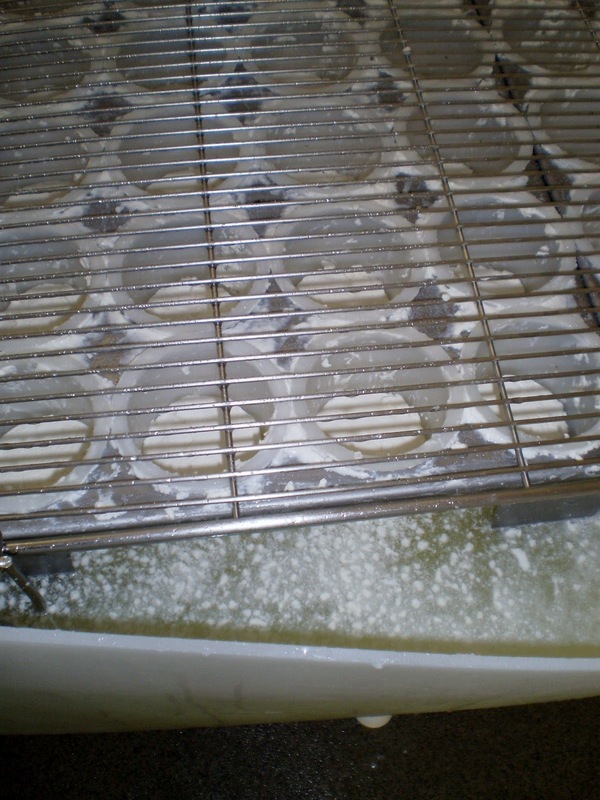 For the Finn, Charlie bought a set of rigid interlinked moulds and draining trays to fit them so they can be stacked as high as the ladler can reach on the draining table. In my case, that’s not actually all that high but for the considerably taller Charlie and Haydn that’s a great space saving advantage. They are also beautifully simple to use. No moulds tipping over of slipping about, you just ladle and ladle until they are full up, then pop a tray and another set of moulds on top and off you go again. As for washing? Well they would be a bit tricky to clean by hand, but if you have a dishwasher there’s no problem, and frankly, if you are making over 400 Ragstones a week, never mind Dorstones, Perroche, Perroche logs for catering, Goats Curd, Finn & Cows Curd, a dishwasher is something you will definitely need. Another thing I was keen to find out about the Finn, is how to control bitter flavours that are an inevitable part of fat breakdown. 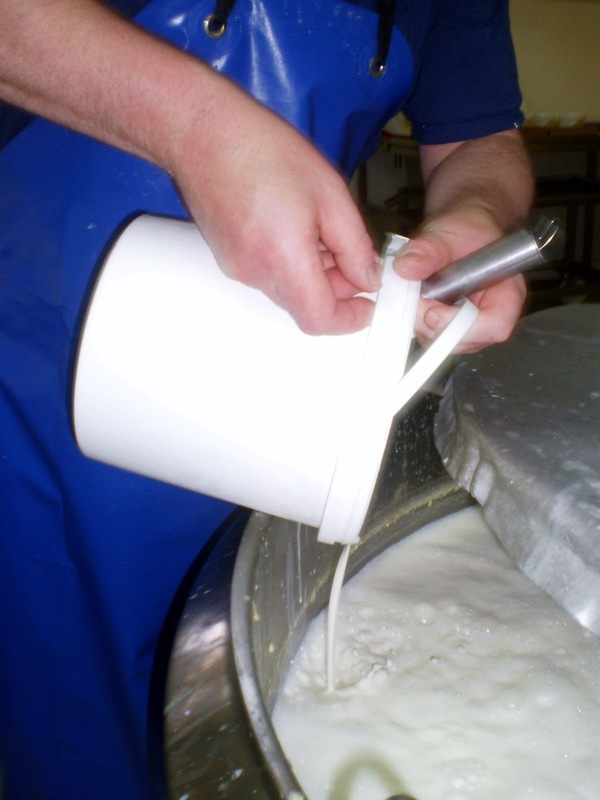 Partly Neal’s Yard Creamery have this under control by pumping the milk more gently so that it is handled carefully as it comes in from the tank. Another aspect in developing the flavour has been dropping the temperature at which rennet is added but rather than protect the fats, this has the effect of allowing greater complexity of flavour to develop from the starter bacteria. It all contributes, however, to having a rich, buttery lactic flavour that showcases the best of the cream and none of the down sides. Before I got embroiled in the vegan debate, I was recounting a visit to Neal’s Yard Creamery. 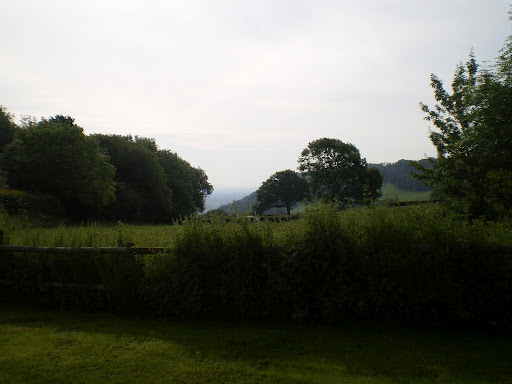 It’s time to return to June and Herefordshire and in this post, lactic set goats milk cheeses. Day 1 at Neal’s Yard Creamery and, bright and early, I headed into the dairy. 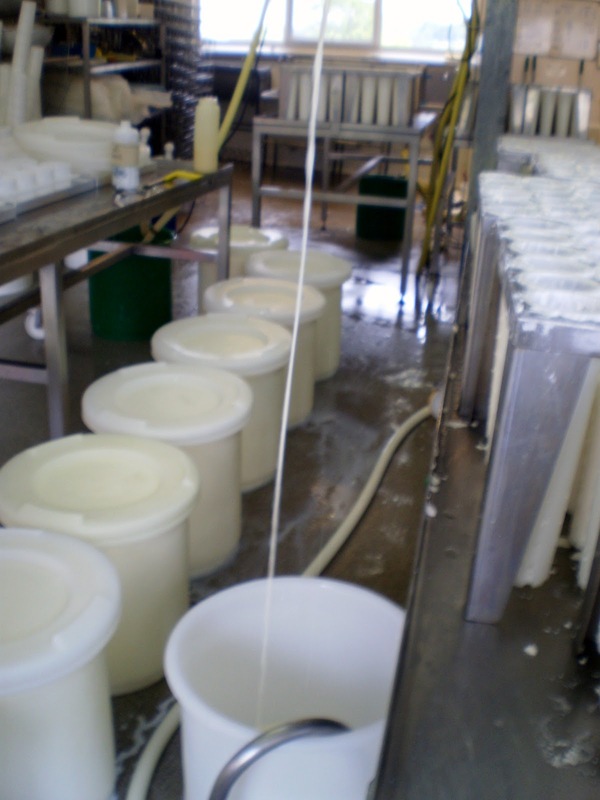 Charlie starts the day checking over the previous days cheeses and doing odd jobs: checking the acidity of the renneted buckets of curd from yesterday and ascertaining when to cut or ladle them, casting an experienced eye over already draining cheeses and levelling out where necessary. I gave him a quarter of an hour to get going without someone asking a million questions (‘but why are you doing that? Where’s the such and such… ‘ etc) and then headed in. Charlie was at work checking pH and ladling an experiment cheese he’s playing with. Shortly afterwards, the next shift started and with the arrival of Ellen and (a little later) Haydn, ladling began in earnest. All of Neal’s Yard Creamery’s goats cheeses are what’s called lactic cheeses. This means that they acidify slowly and over a long period of time but ultimately to a high level. On Monday morning, the cheeses to be ladled were Dorstone, the milk for which had been collected the day before. 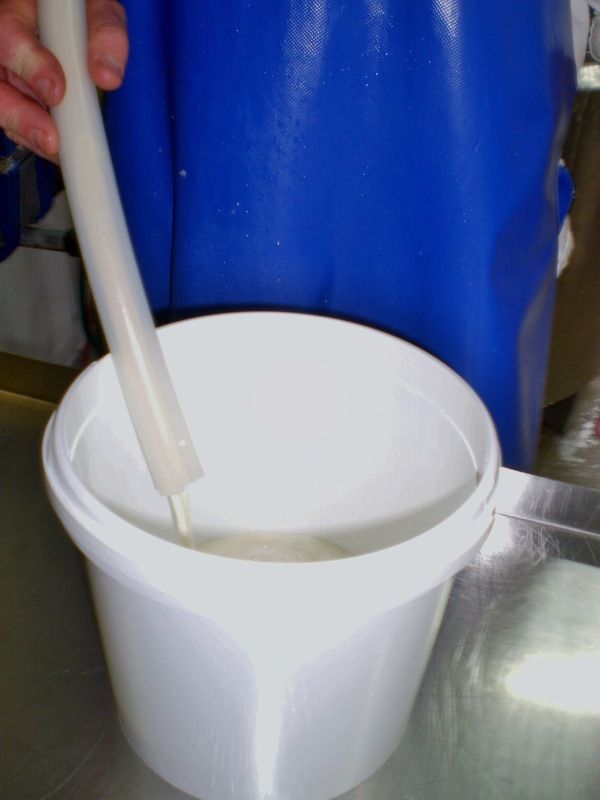 Haydn had been in the dairy, added starter, left the milk to acidify and then at the magic pH point ( I could tell you but I’d have to kill you) had added rennet and left the buckets of curd overnight to set and continue acidification. The following morning we were ready to ladle. 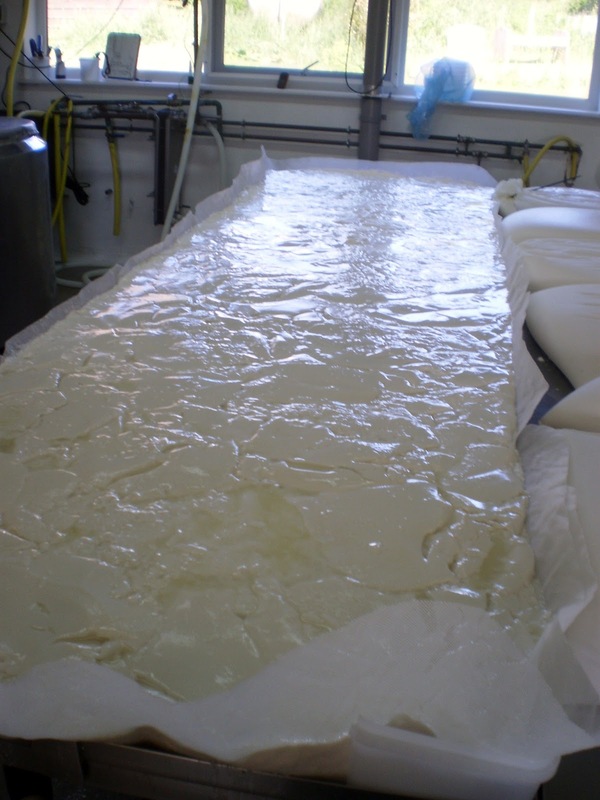 Dorstone curd is pre-drained, which means that before it makes it into the actual moulds that will give it shape, some of the moisture is removed by draining the whole lot of it first. 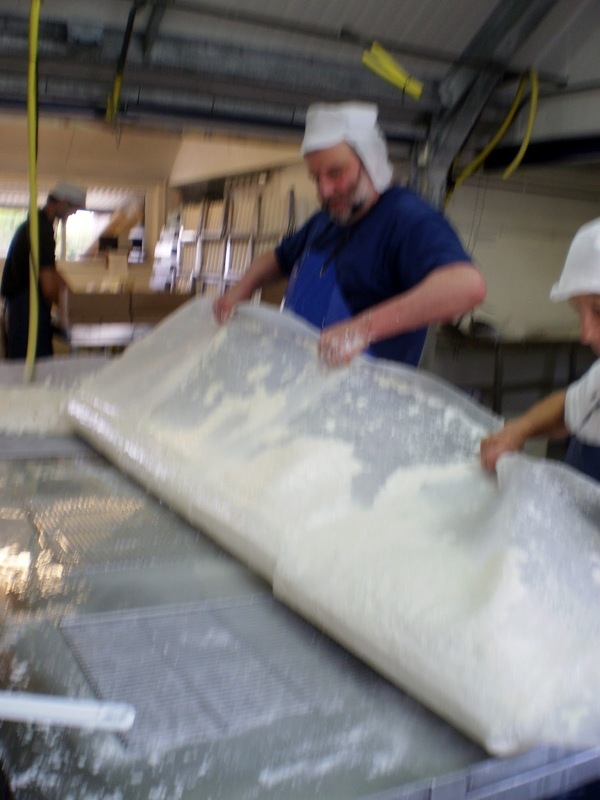 This used to be done in giant sacks that look for all the world like big curdy pillowcases and this is still done for Neal’s Yard Creamery’s goats curd but Haydn is experimenting when it comes to drainage and the Dorstone. The drainage table was lined with plastic matting, curd ladled out onto and initial drainage commenced. 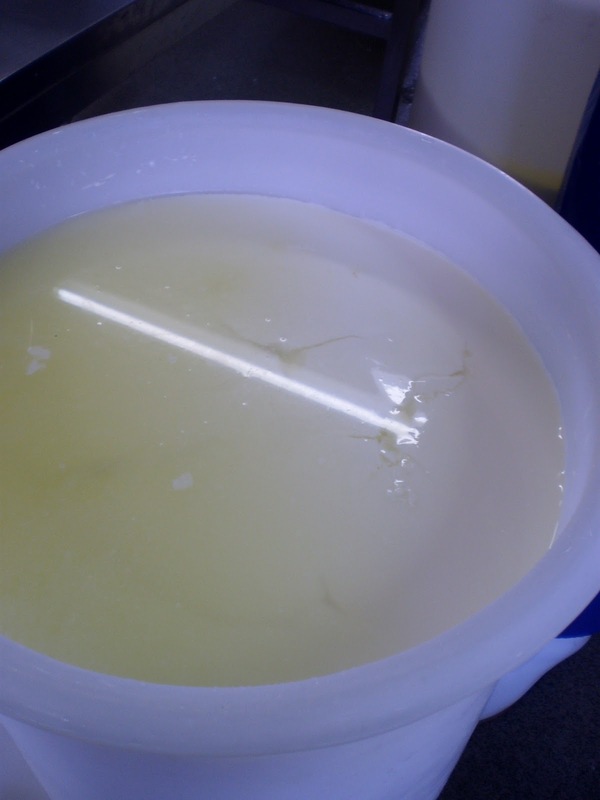 A few hours later, the drained curd will have salt mixed into it and will be transferred into cheese moulds which will then be turned out the following morning. Meanwhile, in a corner of the room, Perroche curd was also being ladled. 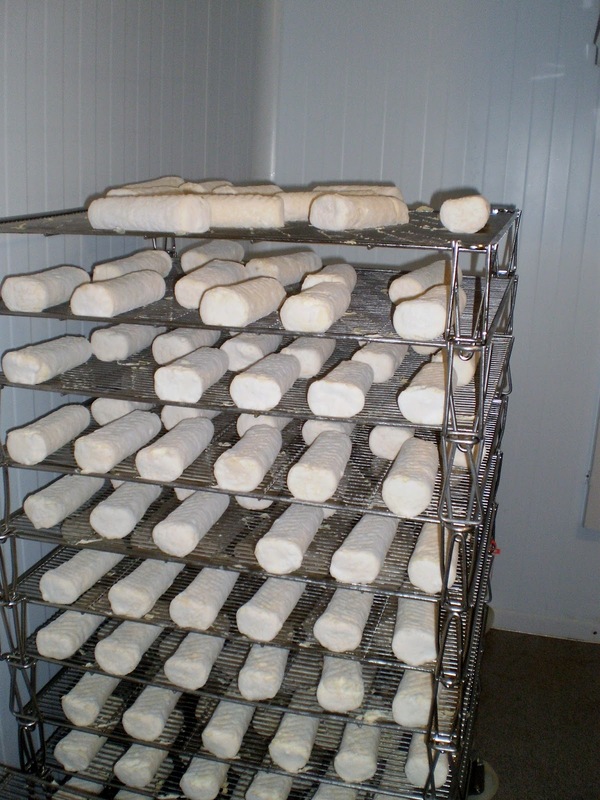 Perroche curd is unusual for a lactic cheese because it is cut. It’s very gently cut and in large squares but a few cuts are made and help get the moisture out. 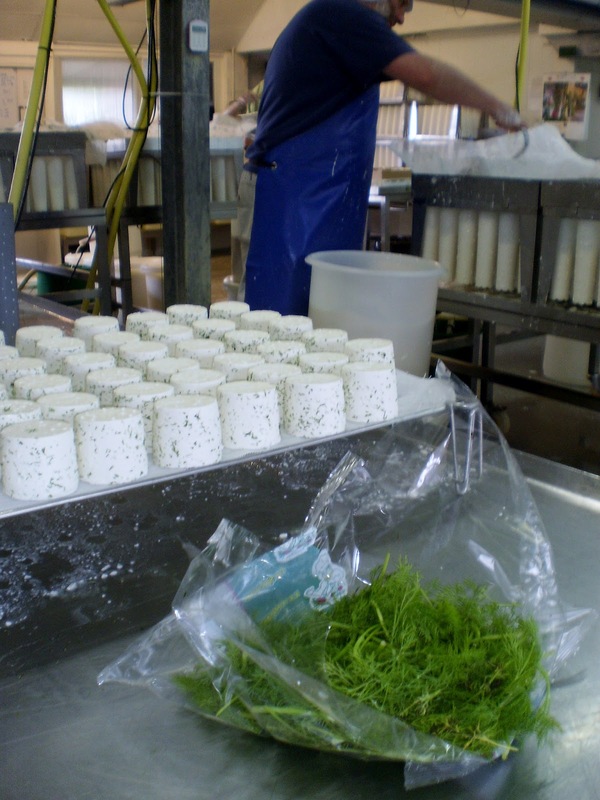 These cheeses are only ever destined to remain fresh and rindless or in the case of the herb perroche, dusted with chopped dill, tarragon or rosemary. Simple, but oh how effective. My particular favourite, since you asked, is dill. 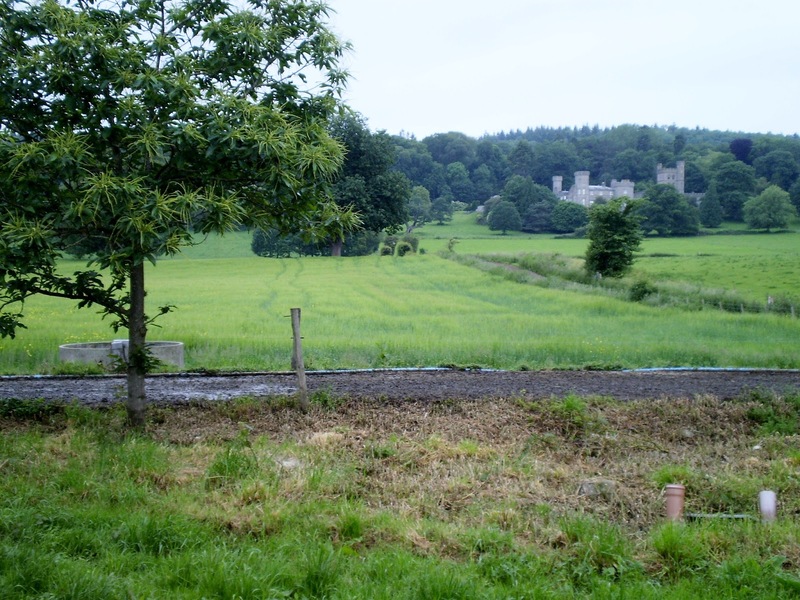 Sadly (for me) the sales on Perroche were good this week and there were none left after orders had been packed. This meant none for me to buy. Not in fact that I was allowed to buy any of the cheese I took home in the end, but I did try! Mid-morning, Tim arrived with a fresh lot of goats milk, which was duly given a dose of starter and destined to be ladled out as Ragstones or Perroche logs the following day. Meanwhile, Haydn was busy preparing more starter for the rest of the week and heating up cream for the crème fraiche (but more of that anon). It is genuinely a hive of activity at Neal’s Yard Creamery but one in which each person has their own area and responsibilities and works efficiently away at them. 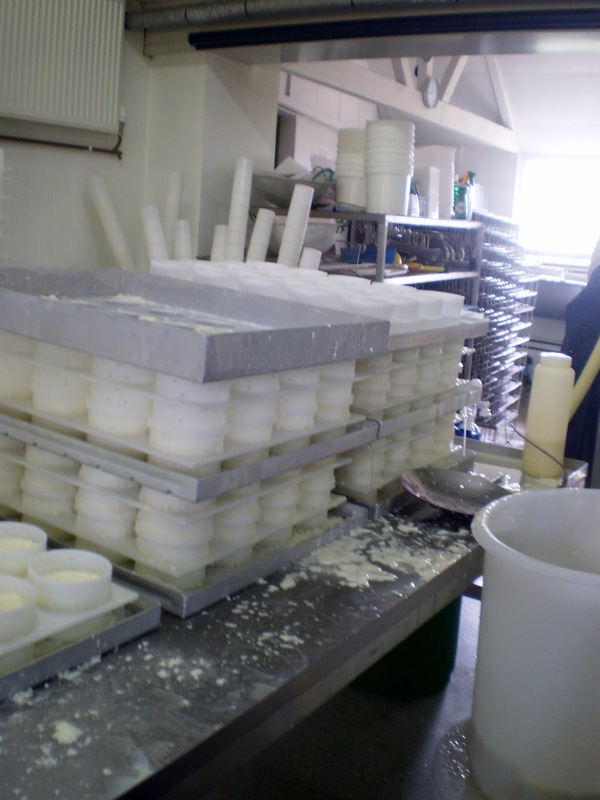 While all the cheese was being looked after and the crème fraiche being prepared, in a quiet, out of the way corner, Strained Greek Yoghurt was being poured into pots and maturing cheeses from the cold rooms were being turned. 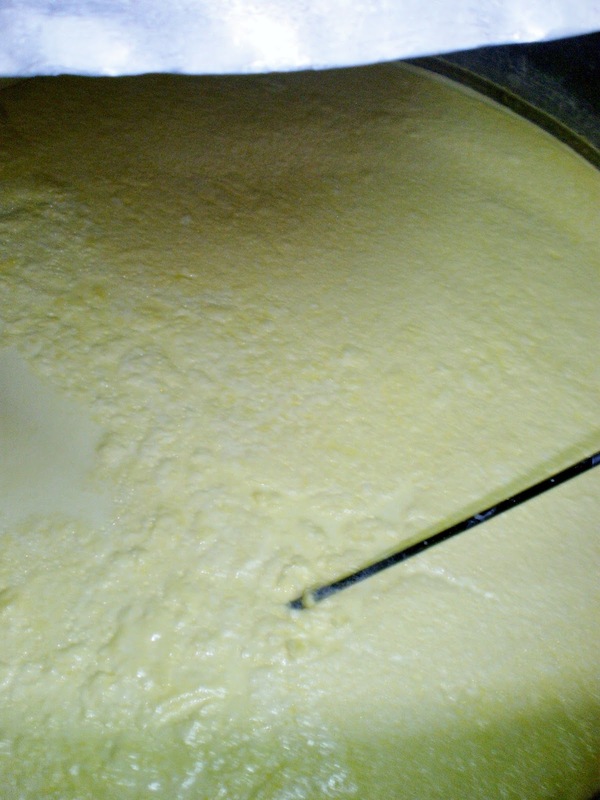 The Ragstone milk is given its dose of starter as the Dorstone milk was. In the afternoon, rennet’s added and the following morning it is time for acidity checking and ladling and so the routine continues. Later in the week it’s the turn of cows milk, Neal’s Yard Creamery’s lactic double cream Finn and their Greek Style Yoghurt. But that, is a tale for another day.